I am constantly amazed at how generous the people in the Filofax community are. Ever since I found myself joining this lovely group of people to celebrate all things Filofaxy, there's been a transformation in my faith in humanity. It's an amazing thing to be part of such a fellowship of people who are like-minded. 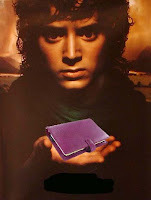 It is a very interesting thing, but the Filofax can break down so many social barriers. We can talk to each other, in chat rooms, on Skype and even with the comments posted on YouTube and our various blogs. Everybody seems to have a generous spirit of giving. I am almost floored by the way people are able to share things, give things away, swap and look out for sales and bargains for each other. How many times have I been messaged that a certain binder I am after is now on eBay or Adspot? Many times when I have swapped or bought something from another filofriend, the return mail has provided me with the whole sample bag of goodies along with the item. What is it that brings the best out of these people? On one hand, I used to think that it was because being interested in Filofaxes is a lonely existence. We may be the only person we know who shares this compulsion, excitement and the wonderment of obtaining and using the humble Filofax. It's a hard thing to try and explain to someone who has not experienced it. Even the disappointment of receiving a new binder then discovering that the rings have been squashed or are not lined up is a problem shared with our friends. There are calls for help on Facebook and other blogs, and in return these receive a myriad of helpful responses. Sometimes there are offers for free replacements, others share tips on how to fix up some small imperfection and others merely commiserate and send a message of well wishes. We're always looking out for each other. That’s who we are. It really and truly is a unique fellowship. I am so grateful to the people that I have been in contact with, although we have never met. One day, I hope we will. Until then let us just continue with our unique and very satisfying fellowship of the rings - all six of them! I often wonder if there is a group in Australia of people who would meet up. But I will admit being able to be part of this FILOship has just been a breath taking experience. I love everyone. Kent, I love your writing!!! They have weekly space for chatting about filofaxes, lots of interesting articles and printables you can download as well.